This card feels like it has an identity crisis kind of, since for decks that can get opponent's to that health on curve it is (in)conveniently the first creature they are likely to play that screams "use hard removal." While for dragon decks, they have so many big hitters that it generally wouldn't matter as much. It feels like it needs something to make it less vulnerable to hard removal when it activates, but I'm not sure what since Charge may be too ridiculous. Maybe if there was some Spell Shield effect that blocked the first spell targeted at a minion? I recently played it for fun in constructed with Brann Bronzebeard. He becomes a 12/12. That's pretty cool. However, I don't think it's really viable. Good card; one of the better common BRM Dragons. 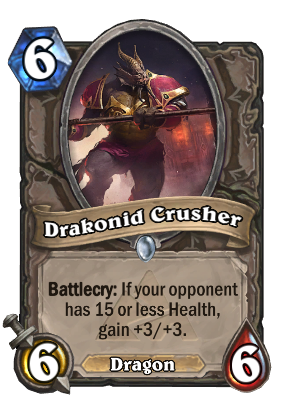 Blizz did misspell "humanoid" in the flavor text.. kind of ironic considering how often players call the card "Drakonoid Crusher". Very good card and OP when opponent is low health making it even harder for them. do you think this would be good in face hunter? I think Handlock isn't gonna like this card very much. Straight up beats their giants and under conditions that are virtually guaranteed in any Handlock matchup. Only problem is that it comes out a bit late to deal with Mountain Giant - normally those are t4 or t5, IIRC. It doesnt have charge and would be the only bgh target in face hunter decks. Maybe youre joking though :-). Drakonid Crusher, Inner Rage*2 & Charge. I think this card is a definate play in dragon decks. It increases the chance for you to win if your are already winning as well though, which may count it as overpowered. I like the general idea though! Why would you compare this top Dr boom? Give me some of whatever you are smoking. You have some good points there. I should have been more clear in saying that this card will only be strictly better than boulderfist if dragon synergy decks become viable. Trading one health for the potential buff and dragon type seems like a power creep, but I think this card is still not being used in constructed for the same reason boulderfist is not being used. They both have equally little board impact compared to the other available 6 drops, even if the buff is triggered on the drakonid.